The Yahya Ayyash Battalion, a jihadi group that last claimed an operation nearly three years ago, took credit for the May 30, 2018, firing of rockets on four different locations in Israel’s Southern District. 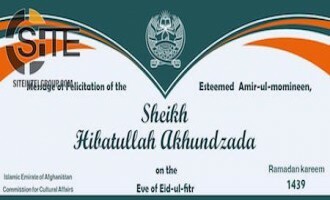 In a celebratory message for Eid al-Fitr, the Afghan Taliban leader Haibatullah Akhundzada offered amnesty and protection to Afghan nationals who cease “aiding the invaders,” and condemned the U.S. moving its embassy to Jerusalem. The Afghan Taliban demanded a "practical response" from the Islamic and "free world" against the U.S. moving its embassy in Israel from Tel Aviv to Jerusalem. The Afghan Taliban remarked that the recognition of Jerusalem of Israel's capital by the U.S. emboldened it to "oppress" Palestinians, manifested in its using force against protestors in Gaza. 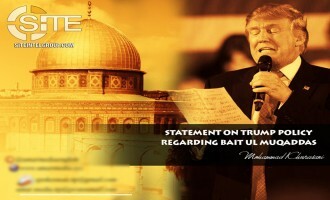 Al-Qaeda in the Indian Subcontinent (AQIS), through its spokesman, Usama Mahmoud, incited Muslims to attack the United States and rallied fighters everywhere to make liberating Palestine their objective in a message responding to the U.S. recognizing Jerusalem as Israel's capital. 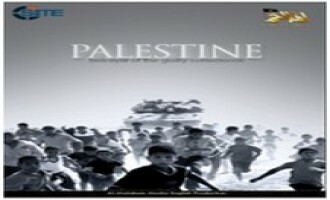 To liberate Palestine, to help all oppressed Muslims and to establish the religion of Allah is the responsibility of all Muslims. 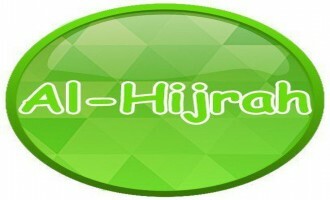 It should be remembered that the majority of the people see the requirement of governmental law before Allah. So my brother! The question will be of mine and your role towards Allah... How can you and I just sit and neglect the causes of these problems and suffering? 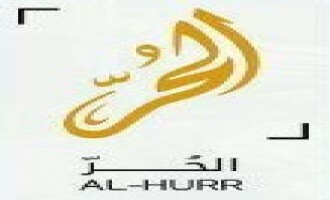 We played a role in cultivating and increasing the wounds of the Ummah. So let us prove that our mujahideen are the protectors of this Ummah... We are not going to let our lands be oppressed and destroyed one after another, and turn our heads away from our fellow Muslims. 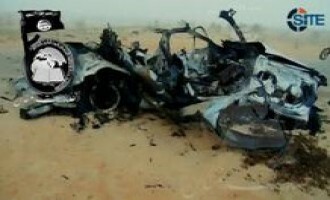 It is a blessing that Sheikh Usama bin Laden asked to kill the Americans. Crush the head of the snake. Let us do our part in this jihad against the United States that it deserves. Let it be known that we are not only fighting in the Subcontinent, and not only in Yemen, Mali, Somalia, and Syria, but we are fighting in the whole world, and our destination is Jerusalem. 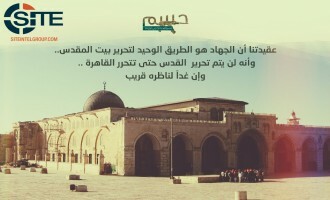 Allah willing, we will continue this journey and the day will come, and it undoubtedly will, when the jihad of the Ummah will become victorious, the flag of Tawhid will flutter atop al-Aqsa Mosque, and the religion of Allah will prevail. Allah made us part of this blessed world... and our time, ability, and blood will prove to be the cause of strength His army. The Lebanon-based Brigades of Abdullah Azzam promoted to Muslims in general that jihad is the sole means to "liberate" Palestinian land in the wake of U.S. President Donald Trump recognizing Jerusalem as Israel's capital. A jihadist published a guide directed to lone wolves in America providing them with ideas for sowing chaos, murdering individuals and groups, destroying infrastructure, and causing financial ruin. 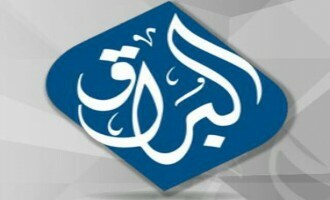 The General Command of al-Qaeda's (AQ) branch in Somalia, the Shabaab al-Mujahideen Movement, promoted jihad and urged Muslims to support the cause of al-Aqsa and Jerusalem with "souls and money," in the wake of U.S. President Donald Trump recognizing the holy city as Israel's capital. For the second consecutive day, the Nasser Salahuddin Brigades claimed firing rockets at Israeli settlements in response to U.S. President Donald Trump recognizing Jerusalem as Israel's capital. 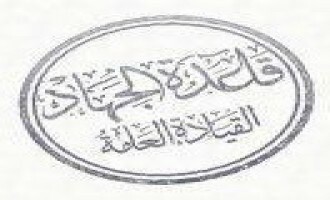 The Syria-based Hay’at Tahrir al-Sham (HTS) condemned the naming of Jerusalem as Israel’s capital by the United States and urged Muslims to act to defend their sanctities. 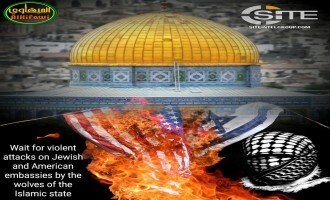 The Kashmir-based jihadi group Ansar Ghazwat-ul-Hind called on Muslims all over the world to attack U.S. and Israeli embassies and harm corporate and financial interests of both countries, in response to the American recognition of Jerusalem as Israel's capital. 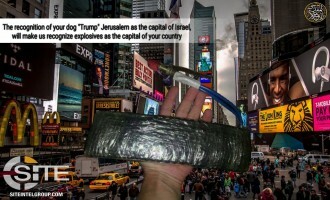 In what it declared as its "first response" to the U.S. recognition of Jerusalem as Israel's capital, a Gaza-based jihadi group claimed a rocket strike on Israeli settlements. 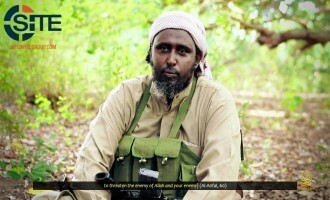 The spokesman for the Somali-based al-Qaeda-linked Shabaab al-Mujahideen Movement, Ali Mahmoud Rage, urged Muslims to take up weapons in response to the United States recognizing Jerusalem as Israel's capital and moving its embassy there. 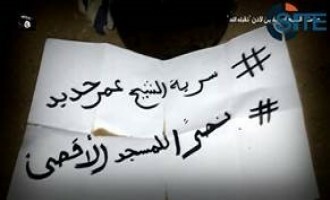 Following the shooting death of three Israeli security forces outside a West Bank settlement near Jerusalem, Islamic State (IS) supporters on Telegram not only lauded the gunman, but distributed multimedia from the group threatening Israel, and incitement propaganda from pro-IS media units against Jews. The Afghan Taliban condemned Israel’s closure of al-Aqsa Mosque and preventing Muslims from Friday prayer there, which followed the shooting death of two Israeli soldiers at the Temple Mount. 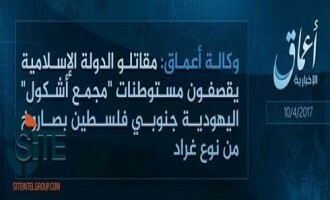 The Islamic State’s (IS) ‘Amaq News Agency reported a rocket attack by the group on the Eshkol Complex settlement in southern Israel. 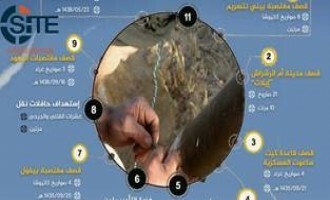 The pro-Islamic State (IS) al-Yaqeen Media Foundation released an infographic of attacks by the group’s Sinai Province on targets in Israel. The Islamic State’s (IS) Sinai Province published photos of a rocket strike on Israeli settlements, which ‘Amaq News Agency identified as the Eshkol Complex. 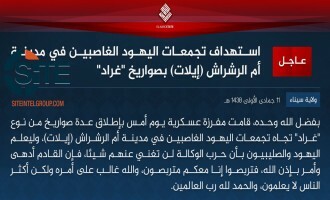 Sinai Province of the Islamic State (IS) claimed credit for a rocket attack on the Israeli city of Eilat. 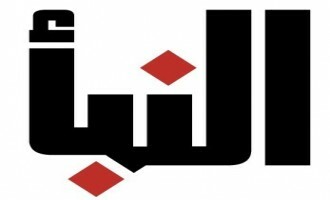 A statement from the "Groups of the Martyr Baha Alyan" claimed credit for the vehicular attack in Jerusalem killing four people and wounding 17. 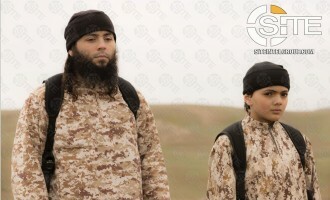 Sinai Province of the Islamic State (IS) released a video threatening Israel and featuring several of its attacks on Egyptian security forces, and the execution of two policemen captured in al-Arish. 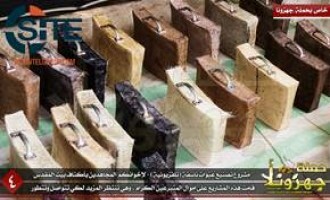 The Gaza-based jihadists behind the “Jahizuna” (Equip Us) fundraising campaign to purchase weapons and arm fighters, published photo reports of concealed explosives it manufactured, and scenes of weapons training. 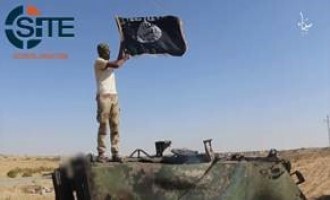 The Islamic State (IS) suggested in its al-Naba weekly newspaper that Egypt and Israel will break conditions set by the Camp David Accords in order to face the burgeoning threat from Sinai Province. The Shabaab al-Mujahideen Movement, al-Qaeda’s branch in Somalia, released a video on attacking Kenyan police and preaching to Muslims in Kenya, and in its concluding segments, incited for attacks on Israel. 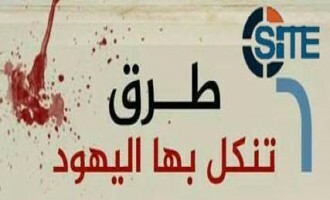 The pro-Islamic State (IS) media group al-Nusra al-Maqdisiya distributed a graphic regarding Tel Aviv shooter Nashat Milhem as a “supporter of the Caliphate”. 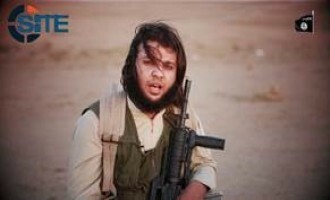 A fighter in Sinai Province of the Islamic State (IS) appeared in a video and threatened attacks on Egyptian soldiers, spies, and Israel, and vowed that the group will storm prisons with suicide attackers and car bombs to free the jailed. 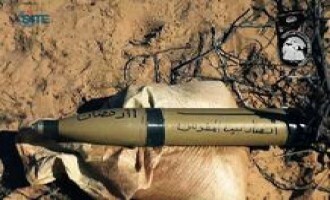 The Gaza-based Battalion of Sheikh Omar Hadid claimed four rocket strikes on three Israeli locations, and charged that the “field monitoring” unit of Hamas confiscated one rocket before it could fire it. 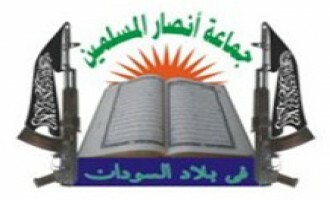 The Gaza-based Battalion of Sheikh Omar Hadid claimed rocket attacks on the Eshkol Regional Council in Israel, and tanks in Deir al-Balah, and threatened car bombings in Israel. 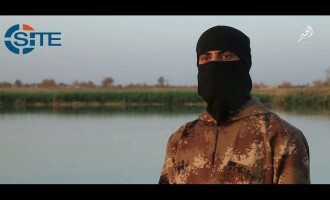 A Hebrew-speaking Islamic State (IS) fighter threatened in a video that the IS will remove borders between it and Israel and eliminate the “Jews,” and promoted the recent incidents of stabbings and vehicular attacks in the country. 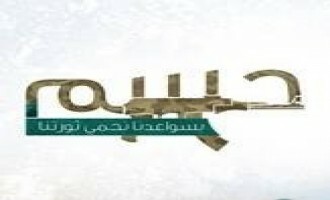 Liwa’ al-Tawhid of the al-Nasser Salah al-Din Brigades in Gaza released a video promoting attacks on Israelis and inciting more incidents of stabbings and vehicular assaults. 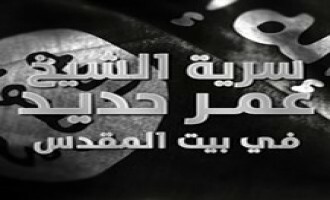 The Islamic State (IS) launched a media campaign promoting attacks by Palestinians on Israelis, releasing several videos from its provinces in Iraq, Syria, and Yemen. 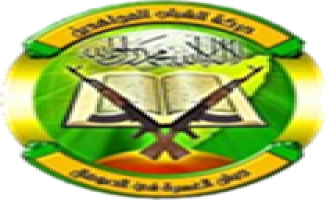 The Shabaab al-Mujahideen Movement, al-Qaeda’s branch in Somalia, called on lone wolves around the world and specifically in the vicinity of Jerusalem to attack interests of Jews and Israel and its allies as a means to support al-Aqsa Mosque. The Afghan Taliban condemned what it called the “latest transgressions” on al-Aqsa Mosque by Israel and called for intervention by the Islamic Conference and human rights organizations. The Gaza-based Battalion of Sheikh Omar Hadid claimed firing a single rocket on the Israeli city of Ashdod in revenge for the killing of Palestinian teenager Hadeel al-Hashlamon and the imprisonment of a Palestinian woman. 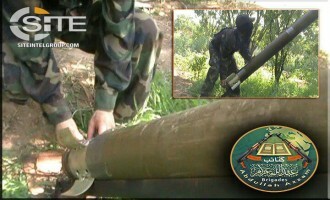 The Gaza-based Battalion of Sheikh Omar Hadid claimed a rocket attack on the Israeli city of Ashkelon and issued a video on the incident. 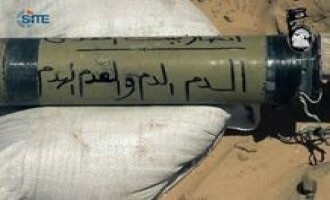 The Battalion of Sheikh Omar Hadid claimed a rocket attack on the Eshkol Regional Council in Israel. 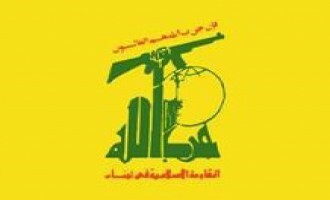 The Battalion of Sheikh Omar Hadid claimed an attack with two rockets on an electric company in the city of Ashkelon, Israel. 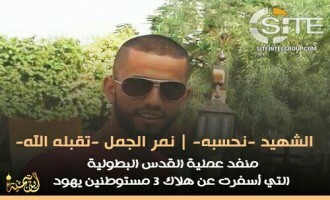 The Gaza-based “Battalion of Sheikh Omar Hadid” claimed a fourth rocket attack on the Israeli city of Ashkelon. The Gaza-based “Battalion of Sheikh Omar Hadid” claimed a third rocket attack on the Israeli city of Ashkelon, and declared that it came partly in response to the recent killing of a Palestinian in the Jenin refugee camp. 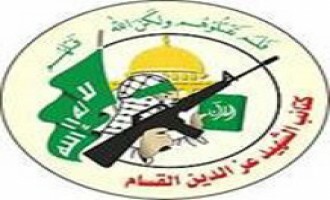 The Gaza-based “Battalion of Sheikh Omar Hadid” dedicated a rocket attack on Ashkelon to Salafist men and women held in prisons of Israel and Hamas. 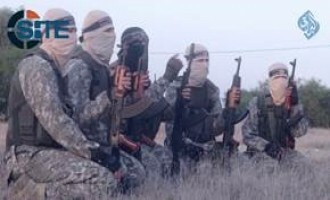 An alleged Gaza-based jihadi group calling itself the “Battalion of Sheikh Omar Hadid” claimed credit for the May 26, 2015, rocket attack on the Israeli port city of Ashdod and gave a 48-hour deadline to Hamas to comply with certain conditions or it would continue to act. An alleged Sinai-based group calling itself “Jund al-Islam” released a video showing a fighter preparing to fire a Grad rocket into Israel and threatening Jews that their “crimes” against Muslims in Gaza and Sinai will not go unpunished. 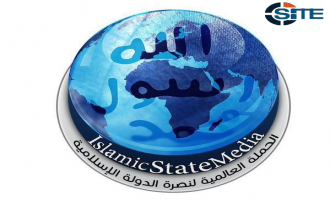 Islamic State (IS)-supporting Twitter accounts began promoting a social media "Twitter storm" campaign scheduled for February 26, 2015, revolving around English and Arabic versions of the hashtag, #IslamicStateMedia." 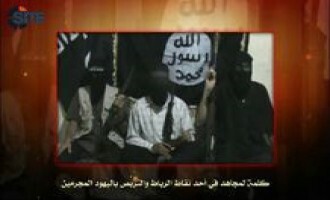 The “Supporters of the Islamic State in Jerusalem” defended itself against accusations of being a fictitious group and falsely claiming as their own the operations of others, and clarified that it is not Ansar Beit al-Maqdis (Supporters of Jerusalem), nor does it speak in the name of the Islamic State (IS). 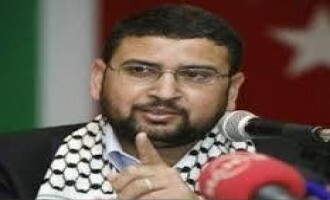 Hamas spokesman Dr. Sami Abu Zahri praised the slaying of four people, three Americans and one Briton, in a Jerusalem synagogue on November 18, 2014. The spokesman stated that the attack was committed in response to the hanging of 32-year-old bus driver Yusuf Hasan al-Ramuni. 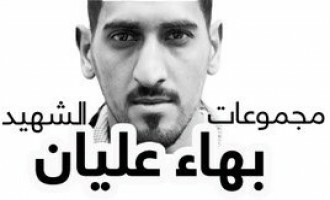 The Yahya Ayyash Brigades, a division of the Brigades of Abdullah Azzam, incited Palestinians to defend al-Aqsa Mosque and emulate Mutaz Hijazi, who shot Temple Mount activist Yehuda Glick in an assassination attempt on October 29, 2014. 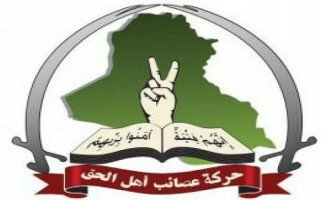 The Afghan Taliban condemned what it called the “latest aggressions of the Zionist regime” against al-Aqsa Mosque in Jerusalem, and urged Arab states participating in the U.S.-led coalition in Iraq and Syria to leave it and instead direct their energies to protect the Islamic holy site. 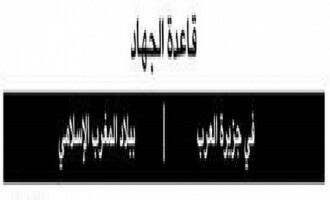 The Sinai-based Ansar Beit al-Maqdis (Ansar Jerusalem) released a second video of interrogating men who confessed to working for the Israeli Mossad, and one who claimed working for the Egyptian army, and beheading them. 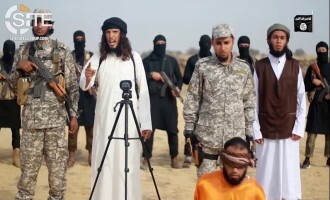 The Sinai-based Ansar Beit al-Maqdis (Ansar Jerusalem) released a video of its interrogating four men who confessed to spying for the Israeli Mossad, and beheading them. The Izz ad-Din al-Qassam Brigades, the military wing of Hamas, and twelve other Palestinian militant factions issued a joint statement declaring victory against Israel in the recent war in Gaza. 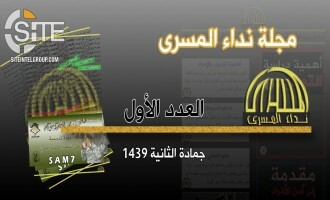 Al-Qaeda in the Arabian Peninsula (AQAP) released an English-language publication drawing from Gaza-related articles from previous issues of Inspire Magazine, and speeches from al-Qaeda leaders, and incited for lone-wolf attacks against U.S. interests. The Mujahideen Shura Council (MSC) in the Environs of Jerusalem released a video of firing mortar shells at Israel and featuring a fighter inciting Muslims to participate in jihad. The Izz ad-Din al-Qassam Brigades, the military wing of Hamas, issued a statement prior to the end of ceasefire with Israel, threatening to lure it into a war of attrition and to paralyze its movement and destroy its economy, and demanding the opening of a seaport. 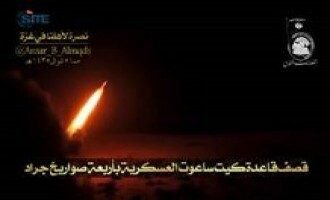 Ansar Beit al-Maqdis (Ansar Jerusalem) claimed credit for firing four Grad rockets at the Ktzi'ot military base in Israel during the night of August 1, 2014, and published ten pictures of the attack. 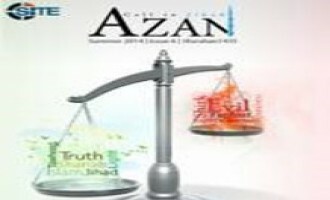 The sixth issue of the English-language jihadi magazine "Azan" suggested targeting former and current U.S. leaders including President Barack Obama, as well as Israeli Prime Minister Benjamin Netanyahu, Dutch politician Geert Wilders, and Florida pastor Terry Jones. 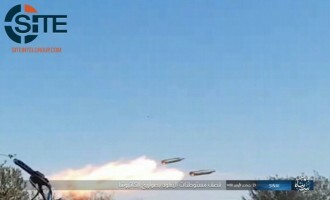 The Izz ad-Din al-Qassam Brigades, the military wing of Hamas, threatened to target all Israeli cities if Israel continues the alleged policy of striking civilian homes and shelters to cover its “military failure”. The Izz ad-Din al-Qassam Brigades, the military wing of Hamas, claimed that Israel violated the humanitarian ceasefire by bombarding civilians in Rafah, and that it has no information about the missing Israeli soldier Hadar Goldin. 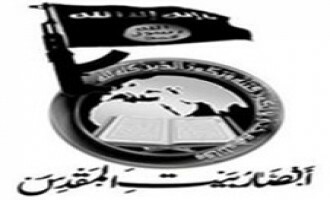 The Nigeria-based jihadi group Ansar al-Muslimeen (Ansaru) issued a message for Eid al-Fitr, which marks the end of the holy month of Ramadan, expressing solidarity with Palestinians amidst the Israeli military campaign, and inciting Muslims in Nigeria to come out for jihad. 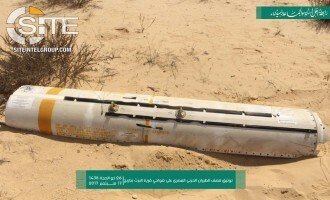 The Sinai-based Ansar Jerusalem (Ansar Beit al-Maqdis) reported that three of its fighters were killed in an Israeli drone strike after firing rockets at Jewish settlements. The General Command of the Global Islamic Media Front issued a statement consoling the people of Gaza and calling upon them to unify for jihad. The "Supporters of the Islamic State in Jerusalem" (Jama'at Ansar al-Dawlat al-Islamiyya fi Beit al-Maqdis) claimed three attacks in the West Bank on July 3, 2014, within its "blessed campaign" in revenge for Palestinian Muslims. The Sinai-based Ansar Jerusalem (Ansar Beit al-Maqdis) released a video expressing solidarity with Palestinians in Gaza and offering rocket strikes in Bnei Netzarim and Ktziot as a "gift". 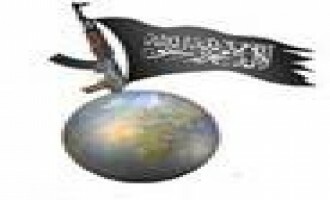 The Mujahideen Shura Council (MSC) in the Environs of Jerusalem denied rumors that its fighters are inactive against Israel during the military campaign on Gaza, and urged Muslims to fight and "support their religion". Harith bin Ghazi al-Nadhari, a religious official in al-Qaeda in the Arabian Peninsula (AQAP), spoke on the recent Israeli military campaign in Gaza, declaring that there is no way to deter it but with jihad. 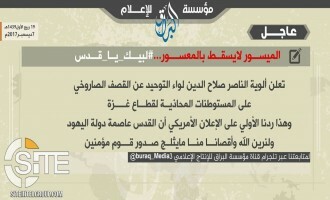 The Sinai-based Ansar Jerusalem (Ansar Beit al-Maqdis) claimed firing three Grad rockets into the city of Eilat in southern Israel, and pledged to continue supporting the Palestinians in Gaza. The Mujahideen Shura Council (MSC) in the Environs of Jerusalem claimed military activity against Israel without giving any details, and urged Palestinians to be patient and resilient amidst the campaign in Gaza. The Brigades of Abdullah Azzam claimed two rocket strikes into Israel: one targeting Ofakim, a city that the group noted is 35km from Gaza, and the second aimed at a "support site" for a Sufa military location. 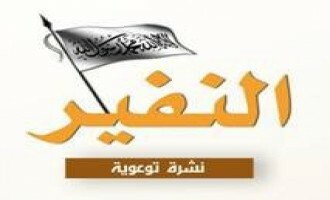 Ansar al-Shariah in Tunisia released a statement on the ongoing Israeli military campaign Gaza, expressing solidarity with Palestinians and urging Muslims to support them and provide assistance to fighters. The Sinai-based Ansar Jerusalem (Ansar Beit al-Maqdis) released a short video of firing five rockets at the "usurped" settlement of Bnei Netzarim in the Negev region of southern Israel. After claiming credit for a barrage of rocket attacks on Israeli targets in revenge for airstrikes on Gaza, the Brigades of Abdullah Azzam released a video showing scenes from its operation.